Ahoy! 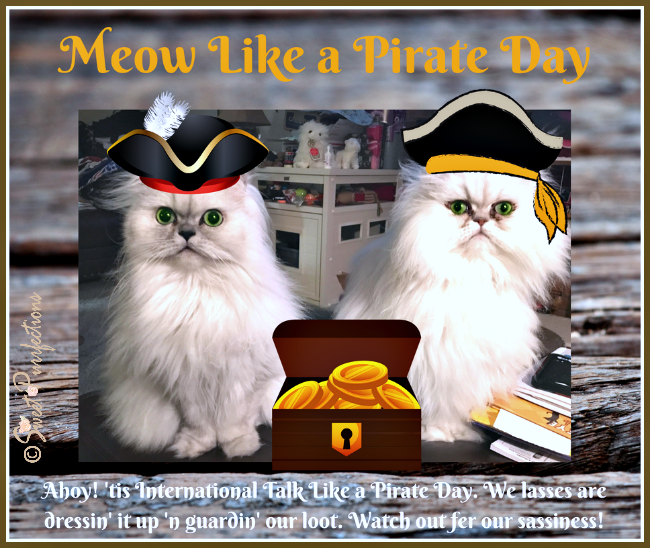 'tis International Talk Like a Pirate Day, but we be meowin' since we be cats. Lady cats like t' dress up 'n be a wee more sassy on this day in order t' guard our loot. We don't needs cutlasses 'cause we 'ave nicely groomed claws. My reaction is confused between "AWWWWWW" and being intimidated at you two guarding your loot. Ahoy, me hearties! Ye make the loveliest pirates I've seen all day, if ye don't mind me sayin'. Happy Meow Like a Pirate Day! Arrrrgh! What fine pirates ye both be! Meow Like a Pirate Day! You girls are cute ! Have Fun Arrrrgh!